This is the time of year when University Relations and the Office of Undergraduate Admissions concentrate on developing and fine-tuning the communication strategy and tools for the coming year’s recruitment push. 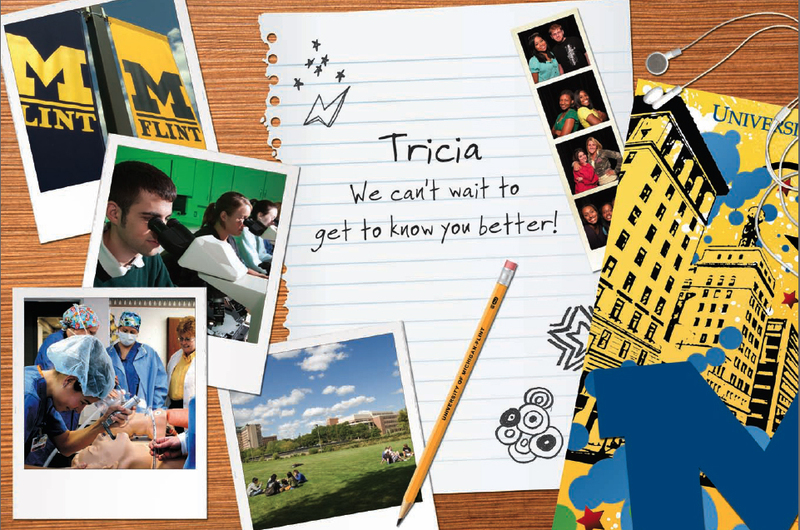 This month, we immersed ourselves in the process of improving one of the more successful communication pieces from last year’s record-setting recruitment cycle: the personalized postcard/website. The Personalized URL (PURL) approach is aimed at high school seniors who have recently taken the ACT. As part of that examination, students are asked about the area of study they plan to pursue in college. 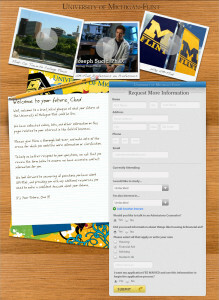 That information, along with the students’ name and contact information, is made available to college recruiters. This enables schools to develop personalized recruitment materials for each student, which can include information related to each students’ stated academic interest. 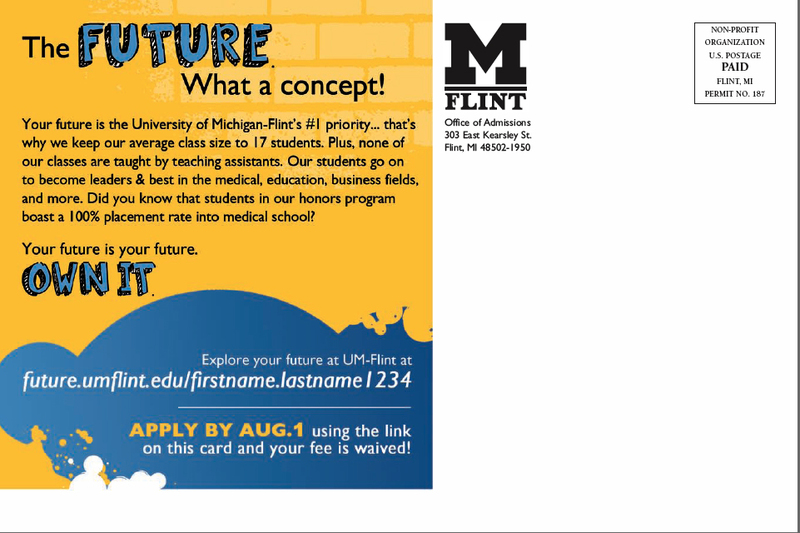 UM-Flint’s Office of Undergraduate Admissions credits last year’s PURL campaign for playing a significant role in generating serious interest in UM-Flint, as well as getting a good number of those perspective students to eventually apply and enroll. Before getting into the changes we’re enacting for this year, a quick overview of last year. As you can see, the name on the front and the web address on the back are the only personalized elements. Nothing was really done with their academic interest information. 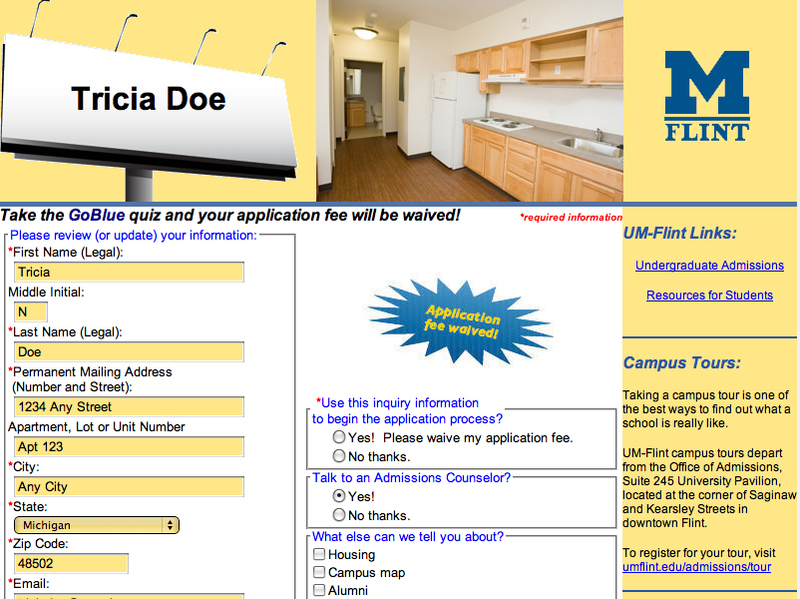 When the student went to their personalized “Explore UM-Flint” webpage, it too lacked information related to the student’s major of interest, and appeared to be asking for even more personal information from the student. 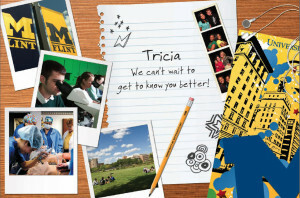 The design of the web page also did not match the look and feel of the postcard or reflect the UM-Flint brand. It was stark, not very inviting, and did not convey academic quality, prestige, or much sense of personal connection. But again, despite these shortcomings, the effort was quite successful. This strongly suggests that the approach is a good one, and with some adjustments, could be even more beneficial to the recruitment process this year. 1). Maintain the high-energy feel of the design, within a more intimate and personal framework. 2.) 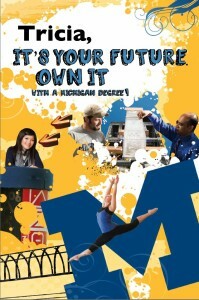 Use more images of campus to give those unfamiliar with UM-Flint an initial view of the physical space. 3.) Take advantage of the student’s stated interest in a given area of study through use of major-specific pictures and copy. 1.) 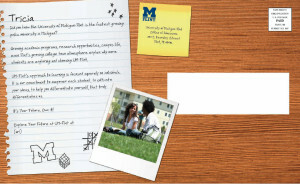 Do of better job of matching the design of the website to that of the postcard – both for the reasons mentioned above, as well as to provide the student immediate visual reassurance that they are at the right website. 2. 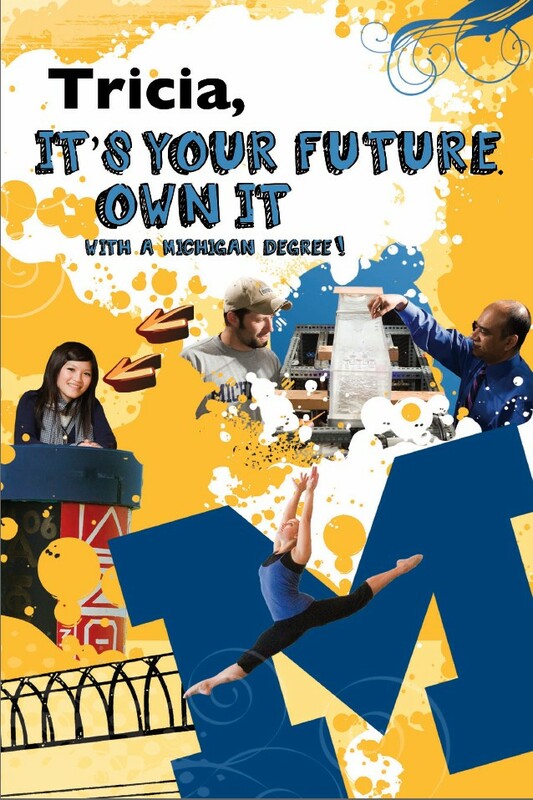 Take advantage of the HD videos UM-Flint produced after last year’s PURL campaign, many of which connect directly to academic areas of interest. 3.) 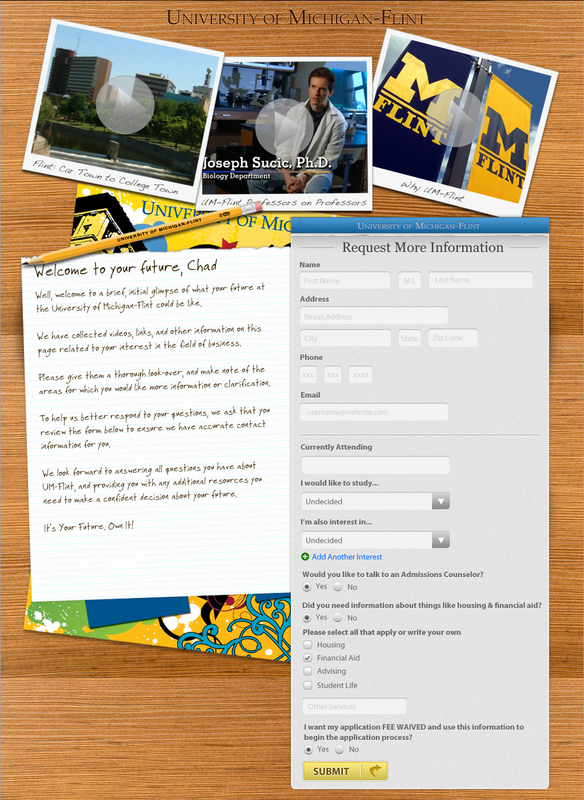 Improve the presentation and structure of the web form to increase response rates. We are excited to see how these changes will impact this year’s results as compared to last year’s! As we have mentioned in previous posts, this is a new and exciting point of pride for UM-Flint. 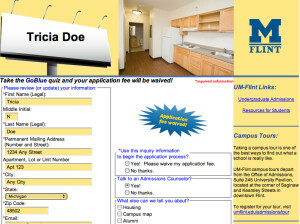 However, it can also lead students and parents to question whether or not such growth might negatively impact the personal, one-on-one interactions UM-Flint has always been known for. It is a fair concern, but one UM-Flint can easily ease minds about. Our faculty/student ratio is still 15:1, our Student Services are still as focused on individual needs as ever, etc. Still, it underscores the importance of making sure each and every interaction, from prospective students to alumni, is a true, intimate, human experience – every time.